Great tour experience. We were met at the cruise port terminal with a sign displaying our names - easy to find. It was nice to avoid the large group travel experience with this private tour. The tour was just the right amount of information and walking. Enjoyed the opportunity to eat street food and try the local cuisine. We had a wonderful time on our Private City Tour of Cartagena. We were met at the cruise terminal with a young man holding a clearly printed sign with our name on it. He took us to our tour guide and driver. Our car was air conditioned and comfortable. 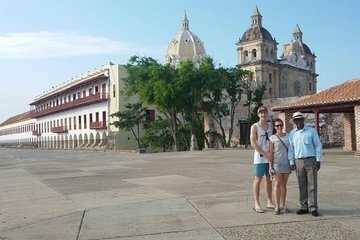 We were able to maximize every minute of our time in Cartagena because of our guide. The highlights of this city were spectacular and our guide provided a wonderful history that we really appreciated. I highly recommend this tour to anyone coming to Cartagena. It is without a doubt, the best way to see the city. Our tour guide was great, knowledgeable with good English skills and arrived at our hotel on time. San Felipe was fascinating but there is a significant climb up and it was hot so wear good shoes and a hat. I have knee and back problems so it was slow going.We saw women climbing up in heels. !La popa was beautiful. In the city, we were taken to a museum that focused on emeralds but then transitioned to an emerald store. It was a soft sell, but I was not interested in buying very expensive emeralds. The museum was interesting and informative. We asked our tour guide for a restaurant recommendation and he dropped us off at a restaurant that sold us one of the best meals we had in Cartagena. We tipped in dollars as I ran out of local money but I think the guides prefer local money because of the fluctuations in the American dollar. Our tour guide, Bert, is a force of nature. 81 years old and can outwalk almost anymore. He is very proud of the city where he was raised. He’s a joy. Still, we were forced into a lengthy wait in the midday sun when the operator failed to secure fort passes in advance as promised. Pretty basic. Our guide/driver, Nico, was excellent. We told him what we wanted to see and he added a few suggestions. His knowledge of Cartagena, past and present, was vast. We learned a lot and thoroughly enjoyed our tour. Extremely disappointed. Tour not as described. Taken to Emerald museum, actually high pressure sales with apparent kick-back to driver. Unprofessional. Viator unresponsive. Do NOT schedule with this tour company. Our tour guide Jhone (hope I spelled that right) was amazing. He was so smart and so fun. His knowledge was enclyopedic of Cartagena. We learned so much! We went to the best places to avoid the crowds and take great photos! He even took us to buy coffee for my dad. We could have stayed longer! Unfortunately our tour was cut somewhat short so we arrived back at our ship 1 hr. before scheduled time to be on board. I would like to have shopped a little - as guide suggested we could. He was very informative, even more than was necessary - knowing I wanted to see the main plaza, perhaps get a pastry or drink. When I asked about a bake shop, he took me to a supermarket! I could have gotten Entenmans cake back home. When we went to Las Bovedas he suggested 2 stalls instead of giving me time to choose my own to shop. Because we chose to eliminate walking, we did not go to the Fortress so we forfeited our tickets.